You know about Luther and Spurgeon, Augustine and Wesley. 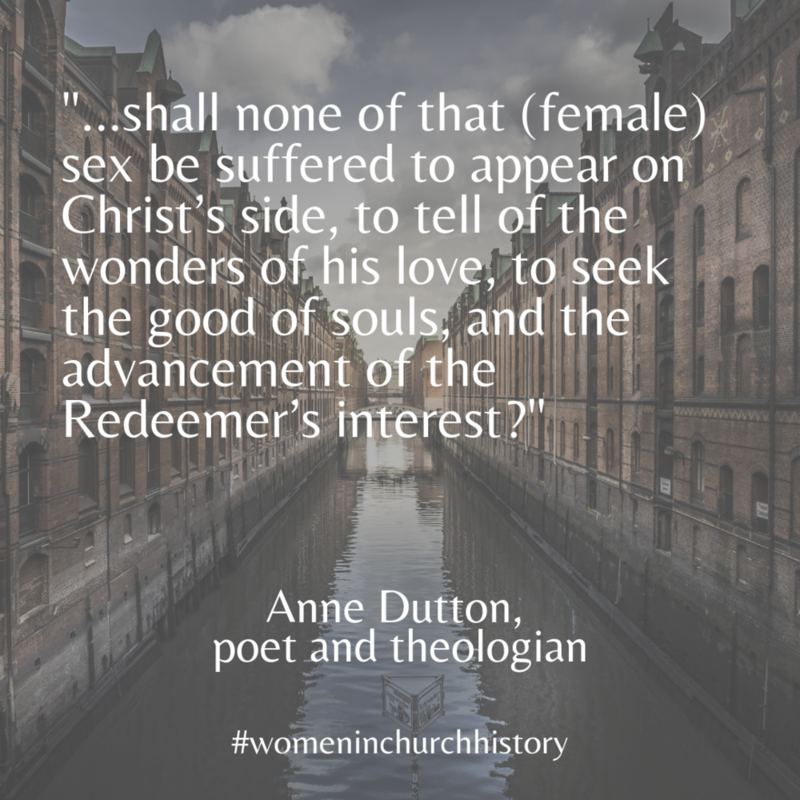 But do you know about the hundreds of women who penned your favorite hymns, who wrote deep theological works, and who lived the gospel faithfully? This women’s history month, let's look at some of them. Selected Spiritual Writings of Anne Dutton: Eighteenth-Century, British-Baptist, Woman Theologian, ed. JoAnn Ford Watson, 6 vols. There they are. The money questions. In my more insecure moments, I wonder how many people silently ask the same (or worse) questions. Kids often ask me questions like, “Where’s your husband? Which kids are yours? Why don’t you have a husband? Why aren’t you married?” These kids understand the world in a very black-and-white way: you grow up, get a job, get married, have kids. That’s your one option as far as life-paths go. I’m not opposed to that for a simple reason: I think we’ve lost a lot if kids don’t see work and family as a healthy ideal. But I’ll be the first to tell you that work and family don’t look the same for everyone. When kids ask these questions, I have a simple answer: because God has different plans for each of us, and marriage has not been his plan for me. I’m careful to answer these sweet, naïve kids with hope in God’s plan for my life, whatever it looks like, because I know that some of those kids may one day be single when they didn’t expect to be. I want them to remember that what God gives is what’s best, even if singleness and childlessness is what he gives. But explaining singleness is a little different when you’re talking to a mid-50s Asian man whose wife is waiting in the car outside. I tried my typical kid-friendly answer (because it’s easy and rehearsed enough to be on the tip of my tongue), and he didn’t understand what I meant. In his culture, singleness—especially for women—is not an option. I wasn’t offended by his questioning because I understood his intent, but it made me think about how I respond to questions about my singleness. Typically, my initial answer to kids about why I’m single does the trick and we move on to another topic. But this sweet man kept asking questions and offering suggestions (“Maybe if you go overseas to do missions you will find someone”), so I had to keep explaining my philosophy behind my singleness. It took me a minute but I eventually got to the heart of it. I am single because I am following God. If I believe that there are no accidents in God’s world, that he is in charge of all that happens to me for good or bad, and that his love for me is what drives his work in my life, then I have to believe each step I take is a response of loving obedience to God. Does that mean I am always, perfectly, 100 percent content in being single? Of course not! Do I feel uncertain when I imagine myself at 50 or 60, still single? Do I wonder how God will provide for me as I age or if I become ill? Absolutely. But obeying God means trusting that he knows what’s coming and how to care for me. It means not being consumed by desires and fears, and choosing to believe that my life will not be wasted—that I will not be ashamed because I trusted God. It means believing that whatever God has provided for this day, whether it’s marriage or singleness, wealth or poverty, sickness or health, is an opportunity to trust that he knows and does what’s best, not only for me, but for each of us. Following Jesus isn’t easy. Anyone who tries to convince you that the Christian life is easy is either fooling themselves or messing with you. But a life given to God for the sake of the gospel results in rewards that far outweigh the difficulties. It’s all worth it—the gospel is worth giving up your dreams and expectations for your life so you can be a part of the grand narrative God is writing. We will not be put to shame for trusting him. So, whether or not you’re struggling, whether or not you feel lonely, I encourage you: be faithful, be obedient in wherever God has placed you, believing that God knows and does what is best, not only for the whole world, but for you—for he knows you by name. I love poetry because it forces me to look at the beauty of words and the way we use them. I was looking for poems about Easter, and John Donne is typically my go-to poet, but this time, I began with George Herbert. His poem “Easter Wings,” particularly its last line, opened my eyes and centered my heart. “For, if I imp my wing on thine, / Affliction shall advance the flight in me.” Amen. Isaiah 40:29-31 reveals the same truth: reliance on God through suffering leads to a unique renewal of our strength. Easter is all about this juxtaposition: suffering and strength. Jesus became weak by taking on flesh, yet he was strong to complete the mission he was given to suffer and die in the place of sinners and then to conquer death through his resurrection. Jesus’ strength in suffering is now given to us through faith in him; we experience the glorious exchange of his strength for our weakness. So now we do not face suffering without hope. We put one foot in front of the other–sometimes slowly–knowing that Jesus walked this road before us, and his Spirit lives within us, empowering us to press on until we arrive in our forever home with God.